The Throne of the Sky-Raiser is part of the Two Sky-Raisers (as-simakan) celestial complex. In ancient Arabic, the term simak indicated something that was used to raise something else high up. When the Two Sky-Raisers reached the midpoint of their travels across the night sky, the uppermost one was almost at the zenith, right over your head, and the lower Sky-Raiser was almost directly below it, about halfway up the sky. The Two Sky-Raisers were the pillars that held up the canopy of the heavens. The Throne is located below the southern one of the Two Sky-Raisers, the Unarmed Sky-Raiser. 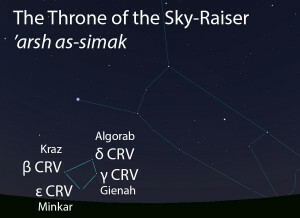 The Throne of the Sky-Raiser (‘arsh as-simak) as it appears setting in the west about 45 minutes before sunrise in mid-March. Sky simulations made with Stellarium. A grouping of four moderately bright stars that is arranged in a quadrilateral shape. The Throne of the Sky-Raiser does not figure in the calendar of the rains stars. The Throne of the Sky-Raiser is not one of the lunar stations. 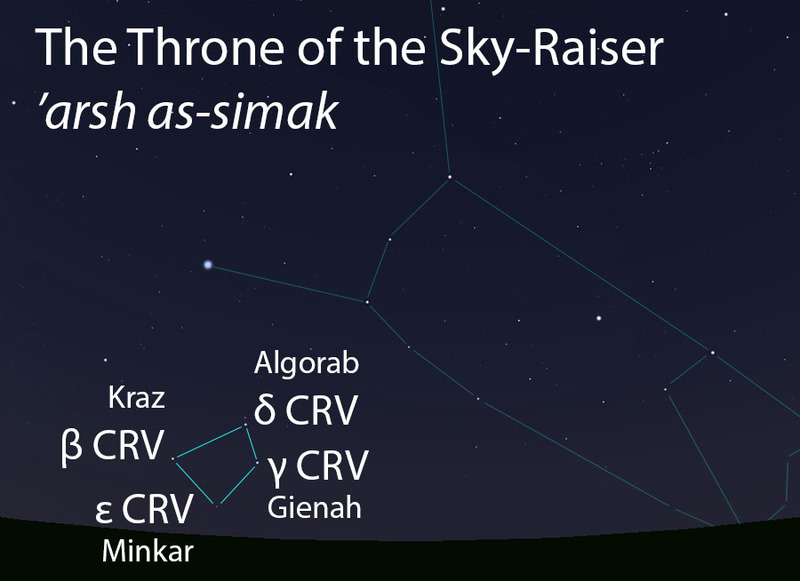 The Throne of the Sky-Raiser is part of the Sky-Raisers (as-simakan, السماكان) folkloric celestial complex.